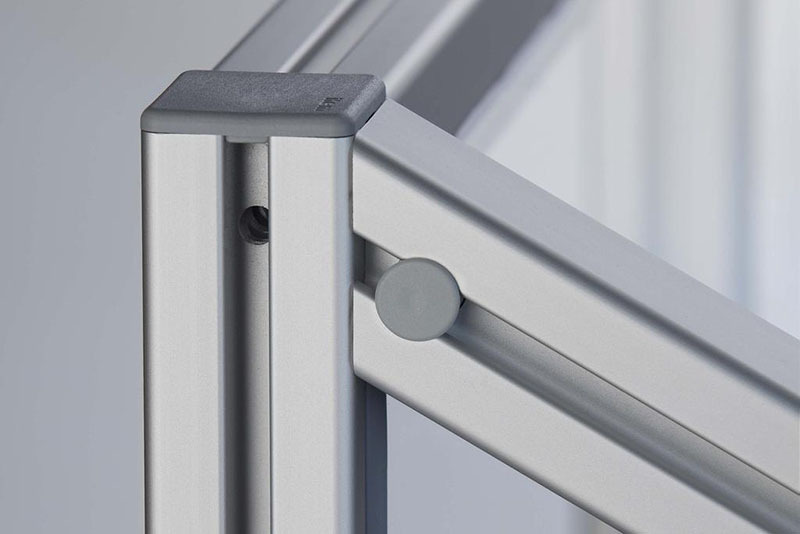 Mitre Fasteners connect two sections of aluminium Profile 8 at practically any angle. 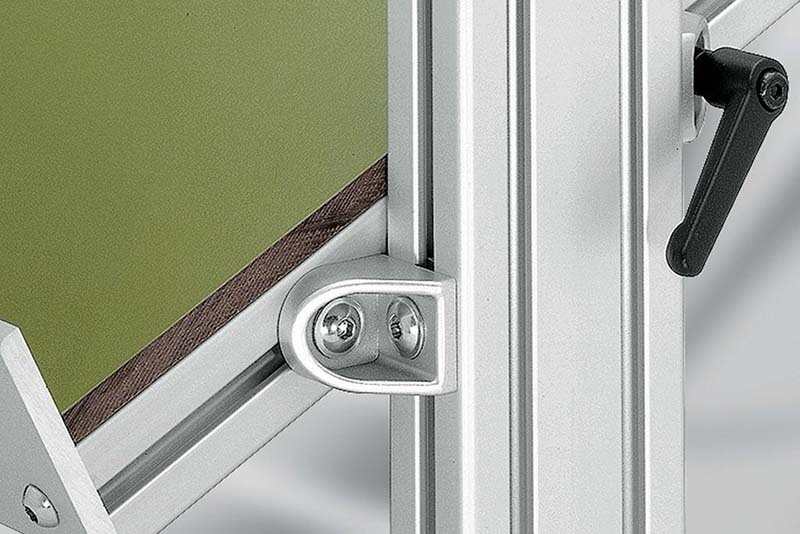 The profile grooves inside the frame remain unobstructed, ideal for holding panels. The clamping pins at right angles to the profile generate particularly high clamping forces. Aluminium profiles can be cut to the desired angle in our workshop. 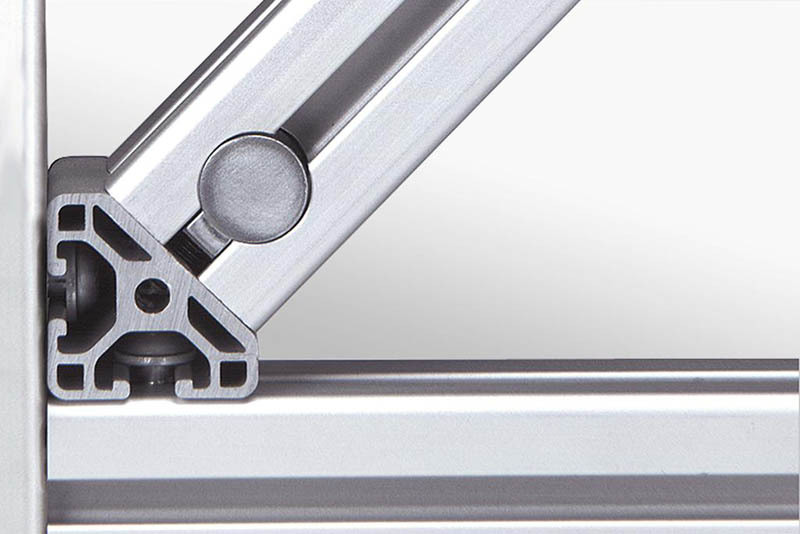 T1 Angle Elements fasten a profile at an angle of 45° when creating bracing and latticework. T2 Angle Elements fasten two profiles at an angle of 45°. The ends of the angle elements are covered with the appropriate end caps. These 45° fasteners are ideal for support braces and trusses. Simple to connect and no need for a mitre cut. Retrofitting to existing frames is easy. 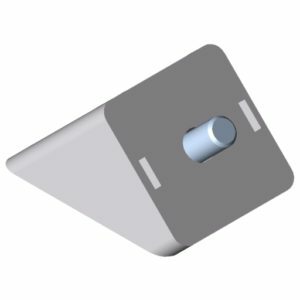 This particular hinge is suitable for connecting aluminium profiles 6 or 8 at various angles up to 180°. 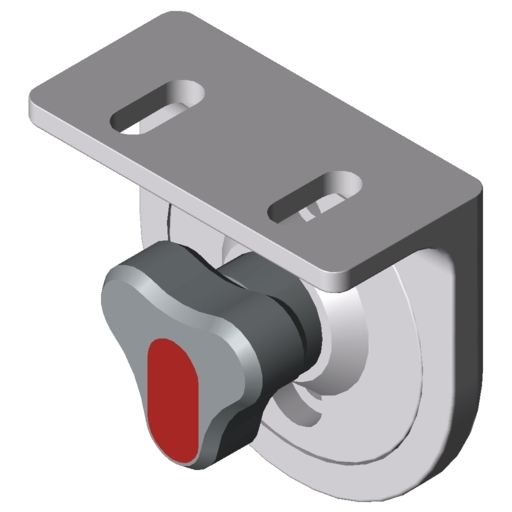 When used with the spacer rings, they can be used as freely movable hinges. Without spacer rings they can be used as rigid angle elements. 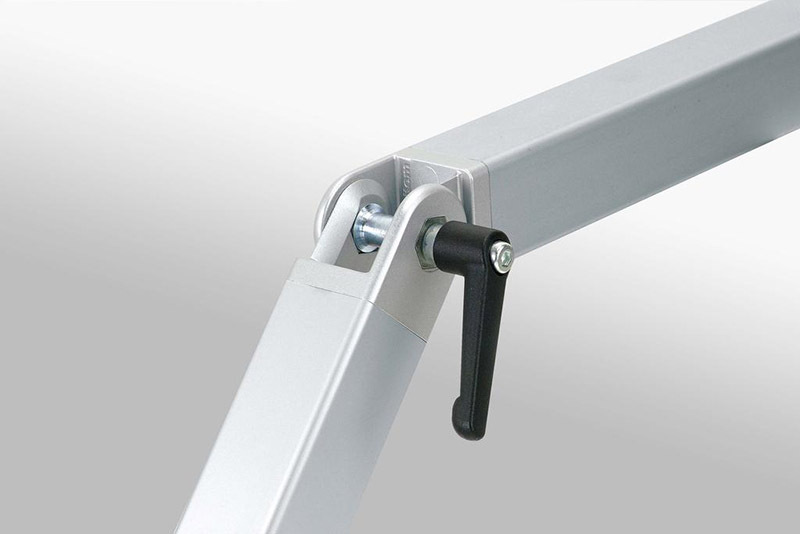 The Hinge with Clamp Lever can be locked in position and released. Angle Clamp Brackets are used for connecting two aluminium profiles whose side faces are in contact and which cross at an angle. The bracket serves as a fixed point of rotation for profiles crossing each other. Connect profile structures at any chosen angle. 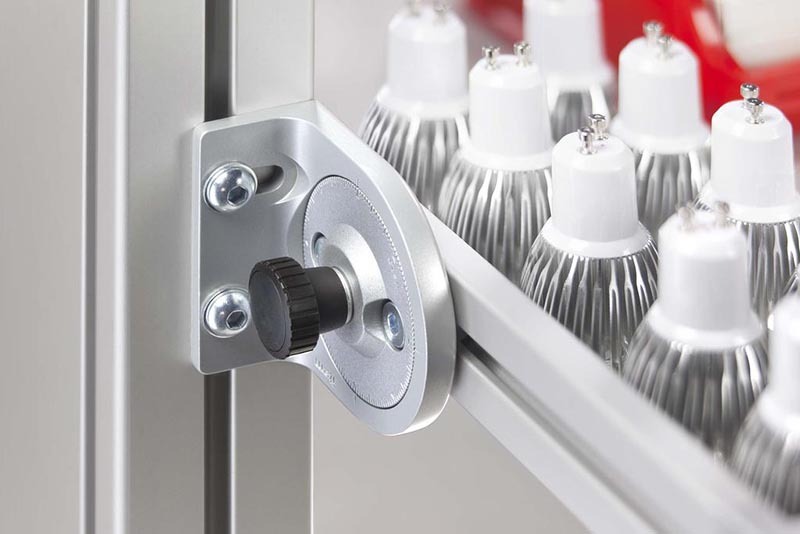 Important areas of application include workstations, jigs, shelves and material trolleys. 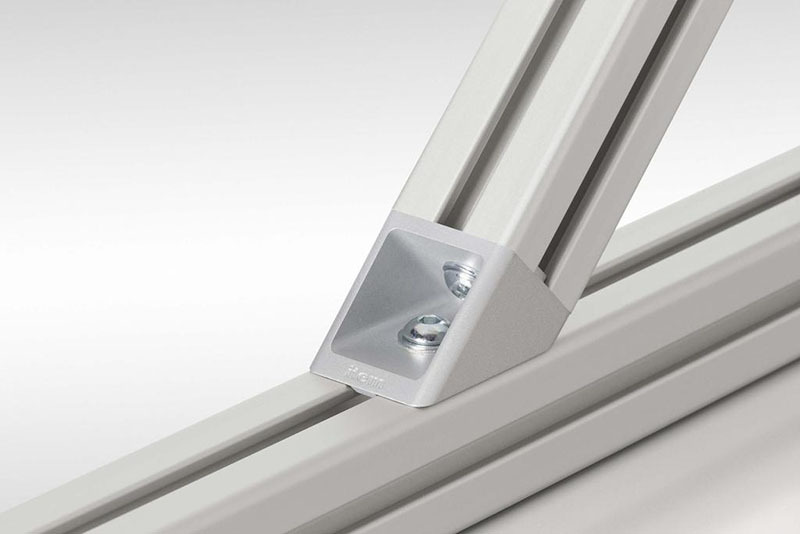 Integrated toothing enables brackets to be secured rigidly so that they can support high loads. This product is particularly easy to use.